200 BHP – Turbocharged – 0-62 in 7.3 seconds – 149 mph – Combined 35.8 mpg. There are hundreds of cars available in the UK market. For people in the trade like ourselves, we look for honest cars, genuine cars, cars that offer value for money. We try where possible to ignore the badge and consider the car for what it is and what it does and what you get for your money. Let me introduce you to one of the most honest cars around, the Skoda Octavia vRS. Long gone are the Skoda jokes as today’s Skoda’s come from the same family as Audi, Volkswagen and SEAT and indeed they all build their cars from the same parts bin. Each marque has its different identity, but under the skin, they are so alike in so many ways. At this point, you might be thinking “Skoda, I would never drive a Skoda” well stop reading this road test right now, as we are not going to convince you. This report is for people who are at one with themselves and are clever enough to know when something is good or not. It’s for people who want a great car, not just a posh badge. The new Skoda Octavia vRS is Skoda’s fastest and most powerful road car ever. Using the same platform and mechanical components as the Volkswagen Golf (and Audi A3 and Seat Leon), there is nothing cheap about this car. The poor relation it isn’t. The cars design is classy as are the materials used in the build are equal to those used in the Golf. Everyone knows how good the VW Golf’s 2.0 litre turbocharged direct injection 200bhp engine is, so that’s one thing you don’t need convincing about. Externally the car is lovely with just the right amount of special touches to make you turn back and look at the car. The front view is striking with its deep front valance and inset front fogs. Side on, it’s the racy green break callipers peeping through the 225×17” alloys that tip you off that this car is a bit different . At the rear, Skoda places a spoiler on the tailgate just to finish the job. What makes the car so nice is how understated it is. Interior wise, the seats with their contrasting silver panels are comfortable and secure, whilst the dashboard instrumentation is excellent whilst the mock-aluminium trim accents pull it all together. Automatic air-conditioning is standard, but our car had an optional sun roof, offering the best of both worlds. Another nice extra on our car was full screen colour sat-nav. On the road, the Skoda Octavia vRS is one of the best balanced cars we have tested. Handling was superb and predictable and you don’t need to be a racing driver to get the best out of this car. Acceleration response is near instant and unlike many turbo engines, this one continues to pull right up to 7000 rpm. The 6 speed gearbox is smooth and crisp. 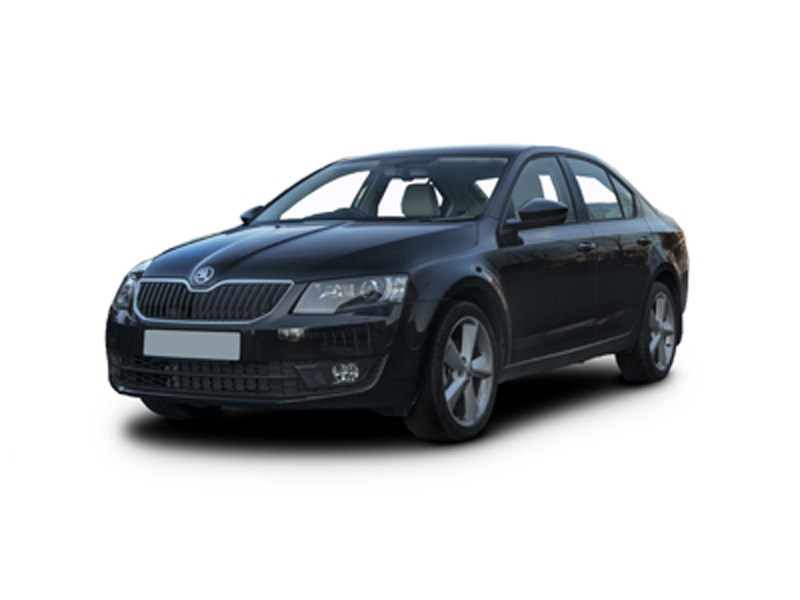 If you fancy something a little different, a car that seats 5 adults in comfort, a car that has a large boot, a car that’s built using some of the best components available, you must consider this car. Alternately, let me appeal to your darker side. If you want a saloon car that’s quicker than most other cars on the road and that can accelerate like a sports car and can carry your 4 scared passengers up to almost 150mph, yet costs just £17,500 on the road. Well look no further. We liked this car a lot and if you can put aside any brand prejudice you might have, just long enough to go to your local Skoda dealer and test the car, we know you will like this car a lot also.